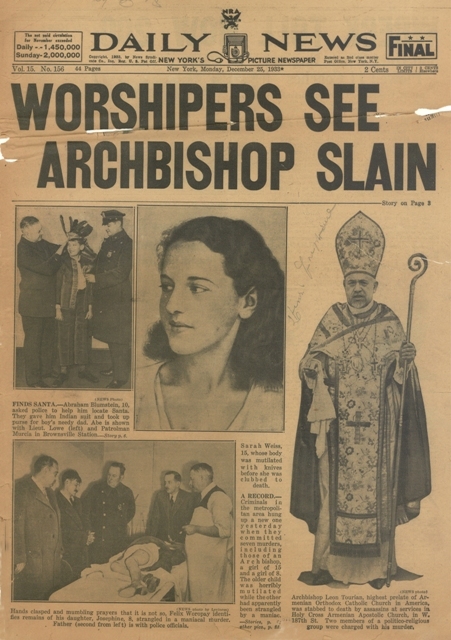 The Zohrab Center recently received a copy of the December 25, 1933 issue of the New York Daily News, which reports on the tragic assassination of Archbishop Ghevont Tourian at Holy Cross Church of Armenia in Washington Heights, NY during a Christmas Eve service there. The paper includes a news story and analysis of events surrounding the murder as well as photos. This treasure was sent to the center by Carol Dabaghian, whose husband Bared’s parents — Vahan and Vergin Dabaghian — saved it for many years. To view the article, please click here. At the bottom of page 3 it says that the article is continued on page 4, column 1. You haven’t posted page 4. Unfortunately we do not have page 4. All the contents that were left of the paper were PDF’d.